UTME Candidates who chose TASUED as first/second choice institution or seeking a change of institution to TASUED through JAMB, having scored a minimum of 180 in the 2018 UTME. Direct Entry candidates with A level/OND/HND/NCE/JUPEB qualification who chose TASUED as first/second choice institution or seeking a change of institution to TASUED through JAMB and have obtained 2018 Direct Entry JAMB form. 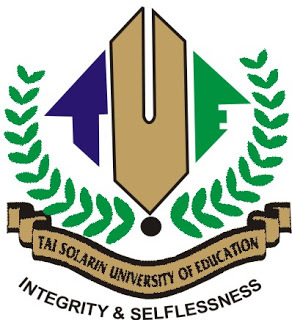 Candidates should apply online through the TASUED Admission portal on https://my.tasued.edu.ng/admission NB: The www.tasued.edu.ng is the ONLY legitimate and authentic website of TASUED through which the Admission portal can be accessed. Print the Screening Slip containing your colour passport photograph and screening information. The printed slip will serve as candidate's identification/admission card for the screening exercise. The sale of the online Screening Form/Registration commences on3rd July, 2018 and closes on 13th August, 2018. Note that wrong/false information provided by any candidate shall render the application invalid and such candidates shall be disqualified. See: Post UTME: Will it be Exams or Admission Screening? Screening exercise shall be conducted for all UTME candidates at the Main Campus of the University on 14th August, 2018. Candidates' participation in the screening exercise is a mandatory requirement for entry into Tai Solarin University of Education. Original JAMB Examination Notification of Result slip or Direct Entry Registration Slip. he results of the screening exercise should be checked on the Admission portal after the screening exercise.